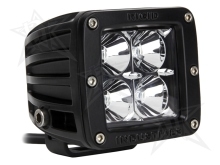 A 4 LED light in a compact 2x2 package that can be used for anything from a reverse light on a truck, a handlebar light on a Motorcycle, to a flood light on a trailer. With over 1300 lumens of light in each one, this small light has the same light output as a 50W MR16. At a small 3"-3" this light can fit anywhere. Pulling only 15W you won't find a more efficient, compact light source in HID or halogen. This light pulls half of what your stock turn signals use. A number of mounting options, including rollbar clamps are available. Contact us for more information.